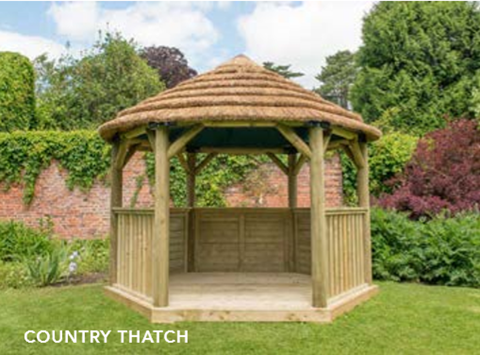 Forest Garden, the UK’s leading and most trusted manufacturer and distributor of quality wooden garden products for over 50 years, has created a range of stunning round timber gazebos, perfect for entertaining, al fresco dining or simply enjoying the peace and quiet of the garden with a good book. All its structures are available either furnished or unfurnished, giving you added flexibility when choosing your dream gazebo. Unfurnished spaces come with just the structure and the base, allowing you to personalise it to suit your taste. If you were to choose the furnished option, Forest will supply a specially designed table, bench seats and cushions, with the options of curtains too, giving you a complete ready-to-enjoy space! 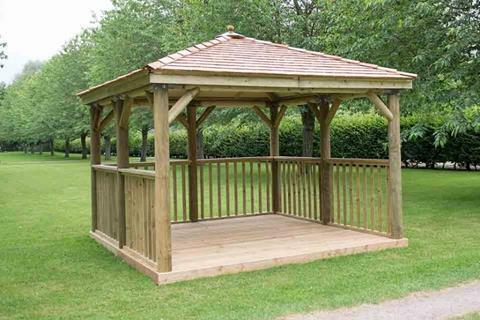 The attractive gazebos are made of radiata pine, which has a smooth sanded finish. There’s a choice of three roof types (Traditional Timber, Country Thatch and New England Cedar) – there’s sure to be a style that suits your taste. As it’s such a large purchase, people will think about gazebos for quite some time before purchasing, often for years. The final decision quite often comes during a summer’s day when families are out enjoying their garden and thinking of how much more they could make of their space. Investing in a gazebo is a big decision, and the Forest range offers great value compared to others on the market and the price includes full installation by the company’s expert team of fitters. The space they offer and their high-quality design and build means they’ll make a real difference to your garden and how you use it for many years to come. The Hexagonal Garden Gazebo is a great useable space to add to your garden. This stylish gazebo can be used for an array of functions from summer BBQ’s to autumnal garden parties or simply relaxing. This hexagonal Garden Gazebo is available in 3m, 3.6m, 4m, and 4.7m. The 3m Gazebo can seat up to 10 adults whilst the 4.7m Gazebo can seat up to 19 – these are great structures for getting together with friends and family. If you’re looking for a beautifully made structure that will give you add character to the garden, then the Premium Oval Gazebo from Forest is ideal for you. Suitable for al-fresco nights or outdoor activities with the kids, these gazebos are both practical and spacious – and it also can be furnished to your meet needs and tastes. One of the trends for 2019 is blending home interiors outdoors, and this gazebo will do this – and more! Gazebos are a reason to get outside as they are an extension of the house which can have a variety of uses: play areas, the outdoor office, entertaining, dining or just generally relaxing. With this gazebo in your garden, you will be adding a new dimension to 21st-century outdoor living! This style is available in 5.1m and 6m. If you have a hot tub or spa in the garden but would like a bit of cover or privacy for the cooler months, look no further than the Square Garden Gazebo. This space offers shelter and protection when you come out of the spa. For added privacy and shelter, drop down curtains are available as a set of four and in a choice of three colours; green, terracotta or cream. They are made from quality outdoor marine canvas, which is also water repellent and fade resistant. As you can buy this gazebo with or without the flooring, you have the added flexibility of building this around your hot tub easily. This product is available in 3.5m with a choice of Timber of Cedar roof. For added privacy and shelter, drop down curtains are available as a set of four and in a choice of three colours; green, terracotta or cream. They are made from quality outdoor marine canvas, which is also water repellent and fade resistant. As you can buy this gazebo with or without the flooring, you have the added flexibility of building this around your hot tub easily. 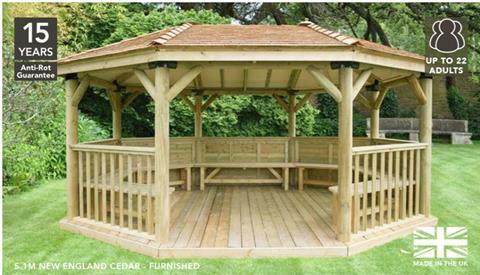 This product is available in 3.5m with a choice of Timber of Cedar roof. All products are designed at the company’s head office and manufactured at its Worcestershire Sawmill division – M&M Timber. These premium gazebos offer covered solutions for gardens, outdoor landscaping and design projects that will stand the test of time and weather. Products can be ordered nationwide through online retailers, high street multiples and garden centres.